You’re launching an online store? Want to upgrade your current e-Commerce website? Zemez has all kinds of Magento Development and Maintenance Services you may need. Magento Fullpackage Installation. Our team will help you to get Magento Engine together with Zemez Theme installed on your server. Get your chosen Zemez theme installed over existing Magento store together with all your store data, including your products, categories, images, shipping methods etc. Get your Magento 1.7 TEMPLATE updated to Magento 1.9 engine version. Price depends on individual customers’ needs. Executed within 2-4 business (working) days. Get your existing Magento 1.7 WEBSITE updated to Magento 1.9 engine version. Get your Magento 1.9.2.4 TEMPLATE updated to Magento 1.9.4.0 engine version. Get your existing Magento 1.9.2.4 WEBSITE updated to Magento 1.9.4.0. engine version. Get new ready-to-use Color Scheme for your Website with all CSS styles, images, etc. Note, the .psd file should be provided. We will check and improve your Magento Website Security and remove all infected and suspicious files from your server. Get your chosen Language Pack installed on you Magento store and ready-to-use Store View for new language. Custom Design Changes for Product & Category Page according to the provided .psd file. You get additional Social Links in Header, Footer, etc. Solving any errors that might occur on your site. We can change the Logo and Favicon Icon for your Magento store. * the Logo and Favicon Icon should be provided. Let our experts transfer your current site’s files and databases for you from one host to another, from subfolder to root or vice a versa. You will receive a detailed form for you to fill to get started right away. Magento system functions (i.e., re-indexing, sending emails, generating newsletters, sitemaps, etc.) depend on proper cron job configuration. Your store won’t function as expected without it. A perfect tool to track website traffic and increase sales. A must for increasing store security, avoiding spam and preventing robots login to your website. A sitemap saves the visitors’ time while looking up the pages and boosts up site SEO performance. Increase your SEO by taking advantage of a natural part of every website. Increase website conversion rate and ensure good search engine ranking. Get your Zemez Template updated to the newest version (modules updates included). *Further, we (Contractors) reserve the right to display work on internet for promotional, advertising, and to store, transmit, and distribute electronic copies of the work (the updated template) for any purpose without prior Customer consent. Get any purchased TemplateMonster or Zemez extension installed on your existing Magento store. Get any 3rd Party Magento 2 extension installed on your existing Magento store. Get new Color Scheme for your Website with all CSS styles, images, etc. According to the provided .psd file. Custom Design Changes for Header and Footer (according to the provided .psd). You get additional Social Links in Header, Footer (Facebook, Twitter, Instagram, etc). Remove unneeded Social Links in Header or Footer. Get any provided Video on any page in your Magento 2 store. Get your Magento 2.1.x WEBSITE upgraded to Magento 2.x. Due to Magento engine heavyweight and complex framework, the Upgrade process may be quite sophisticated. Convey such laborious work to our developers instead and relax while professional Magento Team upgrades your website. Template Update is NOT provided (purchased template must be compatible with Magento 2.x version). Third party extensions / incompatible modules will be disabled or removed. Hosting Compatibility with Magento 2.x version. Complete access to Hosting Cpanel, database, FTP and SSH, Magento Admin access. Executed within 7-10 business (working) days. Get your Website together with Magento engine and Zemez theme installed on your Web-server. The Migration Offer also include the Database Migration. Stores: stores, order status, tax rules, zones and rates, currency rates, product attributes, attributes sets, ratings and customer groups. Detailed site issues review and problems analysis. You’ll receive a full list of problems detected, a list of possible causes of issues and detailed recommendations on how to resolve Magento issues. Request a Free Quote for resolving detected Magento issues. NOTE: You will receive a price quote to fix the problem, if it will work for you then $79 will be deducted from the price quote. In case of a minor fix required to solve the problem (up to 1 hour) it will be supplied for you for free within the $79 you’ve paid for the service initially. A checkbox in the template contact form, newsletter and newsletter pop-up for a consent to the storage of data. Updated Newsletter Pop-Up module with a checkbox for a consent to the storage of data. Click here to order GDPR Suite offer for you Magento 2 store. Note, the offer is limited to the services listed in the description. All the additional changes should be discussed separately and can be performed for an extra fee only. 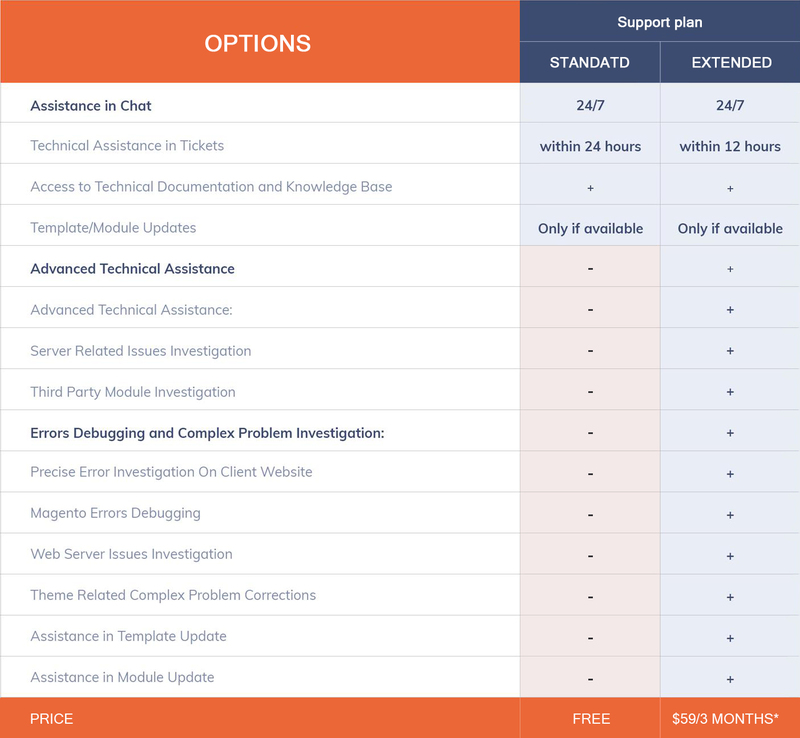 Get Advantage of the Extended Support Plan. Gain access to all theme and modules updates, obtain connection to specialized Magento technicians as well as template developers to fulfill any maintenance needs.